It’s time for a new project – and it’s a bit different than what I usually make! I bought fabric for this back and December, but i’ve wanted to make something similar for more than a year. Last May I went on a trip to The Metropolitan Museum of Art and was fascinated by the statues. Though the medieval european ones were my favorite, I spent a lot of time looking at the Grecian sculptures and came home with dozens of pictures of them. I didn’t settle on an exact style until months later, after seeing this picture. Even though you can’t see what she’s wearing, something about the hairstyle and the novelty of grapes IN a hairstyle motivated me to sit down and come up with a design (that also incorporated grapes in the hair because how cool is that). I used a few of the sculptures I saw as references and finally came up with something simple: A chiton that is paired with a beaded belt and matching crown. I chose to use satin faced chiffon for this project – not the most accurate choice, but it drapes beautifully. Since that can be quite sheer I also purchased linen, which will be used to make a simple rectangle skirt worn underneath it. And since i’m bad at keeping things simple I also bought a ton of beads and sequins for the accessories. I went with a purple color scheme for everything since I wanted the dress to match the grapes – which sounds really silly now that i’m writing this! I decided to start by making the crown first. I chose to go with a floral pattern – partially because I found this embellished garment with a floral pattern to it that i’m in love with. 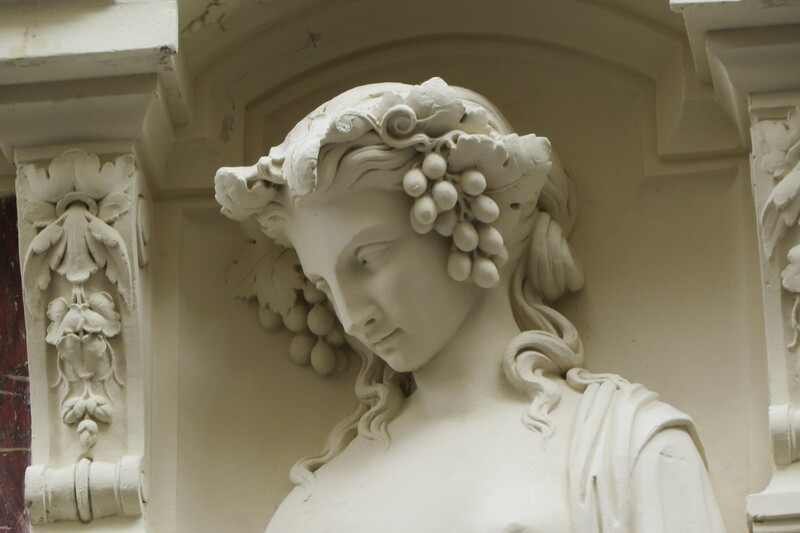 And also because my inspiration picture linked above is of Persephone, a vegetation goddess who is associated with spring, so it seemed fitting! I tried sketching my own floral design but it looked pretty rough. So I ended up tracing the design from the capelet onto my crown pattern. Then I drew some filigree and flowers around it to nicely fill the pattern. I scanned the design into photoshop, adjusted the contrast, then mirrored the image and printed it out. I traced the design onto interfacing, then fused it onto the back of the satin faced chiffon. I used embroidery floss to stitch through the design and transfer it to the front side of the fabric. This turned out pretty poorly even though it took me forever to do. I’d guess each panel took four hours or something ridiculous. It’s hard embroidering from the back of the material! Once both panels were done I ironed them thoroughly to remove the puckers, then sewed them together at the center front. Then I cut out the crown base from felt weight fusible interfacing. I ironed the satin panels onto the interfacing as best I could, then sewed the raw edges to the wrong side. Now it was time for beading! Er, that was the plan at least. I didn’t really like how the beads looked on the crown, so I mostly used sequins. This was also very time consuming, but it was fun to see it come together. I used sequins to define the vine patterns, add sparkle to the leaves, and to trim the edges of the crown. The end result is a bit uneven, but super pretty and sparkly! I’m really happy with how it turned out. I lined the crown with more satin faced chiffon. And shortly after taking these pictures I sewed pieces of ribbon to each end so it can tie around my head. Onto the next piece – which is equally sparkly – the belt! These were usually referred to as girdles, a zone, or a zoster (which is also a medical term for a type of rash, so I wouldn’t recommend googling it). I decided to make the belt from two strips of felt weight interfacing. I covered the strips with satin faced chiffon, then sewed sequins around each edge. When that was done I sewed the strips together and lined the belt. The belt closes with two metal clasps that are from Jo-anns. I found these a year or two ago and bought a bunch of sets since I liked them so much. Now for the skirt. This isn’t a historical choice at all, I just made it for the sake of modesty. I originally purchased a plain off white linen for it, but on a recent trip to Jo-anns I found a striped sparkly linen in the red tag section for $4 a yard, so I ended up using that instead. I cut the three yards I purchased into two pieces that were each fifty four inches long. Then I sewed the selvedge edges together with a ten inch gap left open on one side. I turned the edges of the opening inward and sewed them down. I turned the bottom edge inward by a half inch and sewed it down. Then I turned the hem inward by three inches and stitched it down by hand with whip stitches. But after trying the skirt on I realized it was weirdly long. So I hemmed it once again, this time with running stitches. I gathered the top edge down by hand. After doing this I covered the raw edge with home made bias tape. I made a waistband from the tiny amount of fabric I had leftover. Then I trimmed the bottom edge with more bias tape. I sewed the waistband to the skirt with the right sides facing each other, then sewed two hook/eye closures in place.This isn’t very pretty when you look at it closely, but the only visible part is the hem so i’m not too bothered! The final part is the chiton. I looked online for tutorials since i’m terrible at making garments without an understructure, but I couldn’t find any. I think that’s because they are really easy, and the only “tutorial” you need to make one is a simple diagram like this. I was following that originally but ended up making mine without the fold at the neckline, since the satin faced chiffon has a different texture on one side that would have been visible if I did that. My “pattern” looked like this (well, it was supposed to). I measured from my shoulder to the floor, then added a couple inches (which I regret doing- more about that down below) and that became the panel length. My fabric wasn’t quite wide enough for my arm span, but the sixty inch width that it had looked find so I went with it. Then I turned the top and bottom edges inward by a half inch and basted them in place. Then the edges were turned inward once again and whip stitched down to hide the raw edge. I turned the side edges inward by an inch and whip stitched them down. Since these are selvedge edges I didn’t worry about fraying. I folded the material at the seam line, then measured eighteen and a half inches away from the folded edge. This is where I pinned one side of the neckline. Then I measured twelve inches away from that point on the back panel, and twenty one inches away on the front panel. Once pinned together the front panel will have a cowl neck effect, but the back will be narrow enough that it doesn’t slip off the shoulder. It does make the edges uneven on one side, but I kind of like how it looks that way. I sewed the pieces together at these points. Then I sewed a whole bunch of sequins onto fabric buttons. These were sewn overtop of the stitching shown above. 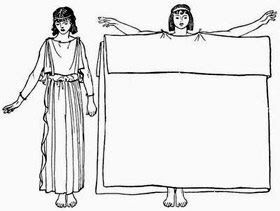 The note I wanted to make about the length of this garment (and why I regret adding a few inches to mine) is that the hem of women’s chiton should touch the ankle. I made mine with that in mind but I made it five inches longer than that length since all the sites I looked at said chitons were longer than the wearer and excess fabric was pulled thorough the belt. What those sites don’t say is that that makes them really unflattering. I looked like a purple blob of material. And since I used such a flowy fabric it drooped over the belt and covered a piece I spent a really long time making. So I pulled the material so it sits below the waistband, and left fabric dragging on the floor. I’ll probably end up hemming it shorter since this makes it difficult to move in, but I kind of like how it looks in photos. It makes me feel more statuesque! And I think that’s it! Here are some pictures of it worn! When I first tried this on I realized the belt prevented the fabric from flowing. To (kind of) fix that I put the belt over the front panel of fabric and tucked it underneath the back panel. This leaves the back panel flowing from the shoulder to the ground almost like a cape. It probably isn’t how they were actually worn, but I like it better this way. It isn’t perfect but I really like how it turned out and it was a lot of fun to make! I think I might try making a peplos next, and maybe some sort of beaded aegis. I can’t believe you think that embroidary was bad…I think it looks fantastic. The colour of that dress is beautiful as is the drape. Not sure if you are a Game of Throner but it would be so awesome if you made a queen series with Cersi, Margery, and Danerys costumes. I just love your work. Wow, looks like Hera. Awesome. wow, that is so pretty, and you are very beautiful! Thank you for sharing. You look stunning, Angela – very statuesque and majestic! It has turned out beautifully, especially the sequins and beading, and I just love the colour! Breathtaking! Loved the color and drape. Big fan of Grecian gowns! Hope you make more variations of them. I can’t believe your patience and the attention to detail you put into each outfit. It always pays off when you do it, though. It turned out beautiful, and that dress is the perfect color for you! Like everyone else here, I love your work and an envious of your creativity and skill. Love this! The chiton looks really great with the cape back and the cowl neckline. It might not have been the traditional way of wearing it but, let’s be honest, I can imagine teenagers of the time experimenting more with their chitons and the way they’re worn. If you’re making more ancient styles of clothing in the future, you might enjoy Janet Stephens’ youtube channel – she’s a hairdresser who’s researched and recreated ancient hairstyles using authentic techniques and tools from the time. It’s really interesting stuff. Hi! I’m new to your blog and I am enjoying every bit of your posts. Thank you so much for sharing the detail of your process. I love your blog, it has been very helpful and inspiring to me as a costumer! Wow! Wow! Wow! This is flawless. Nice work. The detail on the crown, gorgeous! Hello! The end result is fantastic 🙂 And your embroidery wasn’t bad at all!